In celebration of the first day of Spring, these Java Coconut Éclairs are the perfect way to prepare for the warmer days to come! Éclairs have long been one of my favorite desserts to order at a bakery, but I was always afraid to make them at home. I’d heard that they were somewhat difficult to make, so I always avoided them. I’d occasionally pick up the recipe and think about it, but it would always end up back in the recipe box. Well, during last week’s snow storm, I decided I needed to make something that reminded me of Spring. I needed something fun and delicious. I needed something to make me forget about the snow piling up in my driveway. So I pulled out my éclair recipe and decided to give it a shot. Well guess what? Éclairs are way easier to make than I thought! 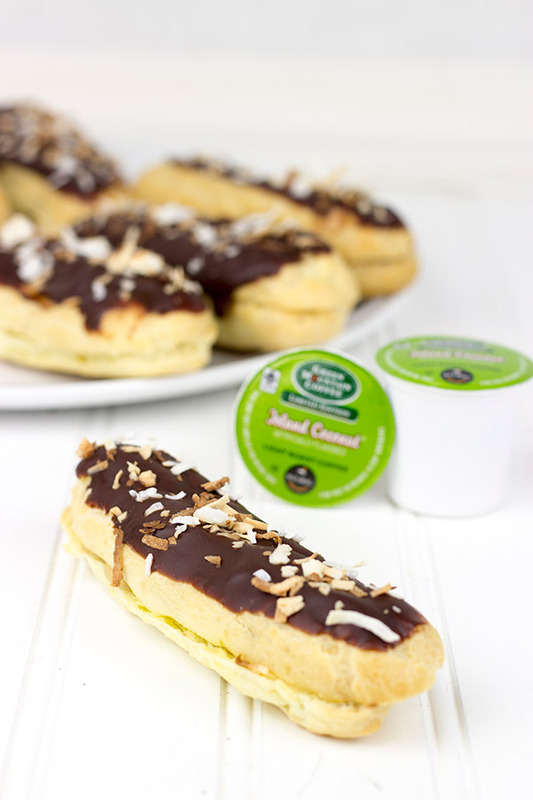 In honor of Spring, I used Keurig Green Mountain’s new Island Coconut coffee for the cream filling. 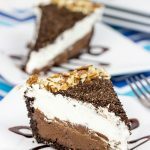 Coconut, coffee and chocolate? How can you go wrong? The dough used to make éclairs is called pate a choux (paht-a-shoo), which is actually French for cabbage paste. Geez, I know the French are renowned for their pastries, but they sure know how to make them sound unappetizing! The term actually comes from the fact that this same dough is also used to make cream puffs, and cream puffs resemble little cabbages. If you’ve never made pate a choux before, then you’ll be a bit surprised by it. It’s probably not like any other dough you’ve ever made. It actually starts in a saucepan on the stove, and it ends up as a very smooth and soft mixture that is almost closer to a batter than a dough. The dough is then actually piped out of a pastry bag onto a parchment-lined sheet pan. Yup, I told you it was different! But with that said, pate a choux is incredibly easy to make. Plus, it’ll impress the heck out of your family and friends when you pull out a batch of these homemade Java Coconut Éclairs! Instead of the traditional vanilla pastry cream, I made a coconut + coffee cream using Keurig Green Mountain’s Island Coconut coffee. Island Coconut is a seasonal coffee, and it just so happens that it will be released this coming Monday (March 24th). I don’t know about you, but I’ve been daydreaming about warmer weather since, oh, January. I’ve been enjoying this Island Coconut coffee in the mornings recently, and it’s been a delicious change of pace. I can almost imagine sitting on a sunny beach surrounded by palm trees. Warmer days are coming! But in the meantime, a batch (or two) of these Java Coconut Éclairs is a great way to celebrate the first day of Spring. Note: I received free samples of Island Coconut Coffee from Keurig Green Mountain, but I was not compensated for this post. All opinions expressed are my own. Using a medium saucepan, add the water, butter and salt. Heat over medium heat until mixture begins to simmer rapidly. Add the flour all at once; stir vigorously until well mixed. Continue cooking over medium heat, stirring constantly, until mixture forms a ball and pulls away from the sides of the pan (only 1-2 minutes). Transfer the mixture to the bowl of a countertop mixer fitted with the paddle attachment. Beat on low speed for 3-4 minutes to allow the mixture to cool before adding the eggs. Add the eggs one at a time, mixing thoroughly on medium-low speed after each addition. Once all the eggs have been added, mix for 2-3 more minutes. Transfer the dough into a large pastry bag fitted with a large, plain round tip. (In a pinch, you can use a sandwich bag with a large corner snipped off.) The tip of the bag should be 1/2" - 3/4” wide. Pipe the dough into 5” long strips on a parchment lined sheet pan, leaving 2"-3" between each strip. Bake at 425° for 15 minutes, then reduce oven temperature to 375°F and continue baking for another 15 minutes. Turn the oven off and open the door slightly. Allow the baked shells to cool in the oven for 30 minutes, and then transfer to a countertop to cool completely. Place the coffee in a medium saucepan over medium heat. Simmer until the coffee has been reduced to 1/2 cup (~10 minutes). Meanwhile, in a medium bowl, whip together the egg yolks, sugar and cornstarch until smooth and pale in color. Once coffee has been reduced, add the milk to the saucepan and return mixture to a simmer over medium heat. Once mixture begins to simmer, slowly pour about half of it into the egg mixture, whisking vigorously the entire time. Pour this egg mixture back into the saucepan with the remaining milk. Bring mixture to a boil and then continue cooking for 1 more minute, stirring constantly the entire time. Remove mixture from the heat, and continue stirring for another 2-3 minutes. Add the butter and vanilla extract; stir until fully combined and cream is smooth. Set cream aside to cool. Heat 1" of water in a medium saucepan until it begins to simmer. Place a small, heat-proof bowl over the saucepan. Add all of the ingredients (chocolate, butter, corn syrup and water) to the bowl, and stir occasionally until the chocolate has melted and the mixture is smooth. 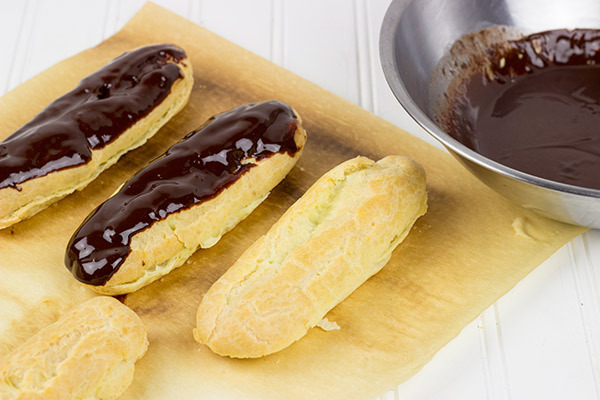 Remove mixture from heat and allow it to cool at room temperature for 20 minutes before applying to the éclairs. Using a bread knife, slice the top half off of each shell. Fill a pastry bag fitted with a medium-sized round tip with the Pastry Cream. Pipe a thick layer of cream onto the bottom half of each éclair. Place the tops on the éclairs. Garnish tops of éclairs with toasted coconut. Let cool at room temperature or in refrigerator for 30 minutes before serving (to allow the chocolate to set). WOW!! You rock! Love the recipe, totally inspired! My hubby and kiddies would be drooling over these! Happy Spring! Thanks, Brenda!! I’m pretty sure I was drooling when I made these, too. Good thing the drool didn’t make it into the pictures…hah. Happy Spring to you, too! Well what do you know, I’m drinking Green Mountain Coffee now! Unfortunately I do not have one of those fabulous eclairs to go with my coffee! I’ve never tried to make my own, but I suddenly feel very inspired! It has definitely been a rough one this one, Kristina. I absolutely can’t wait to get the grill out again…and I could really go for some roasted marshmallows right now! Thanks for commenting! These look delicious! Definitely looking forward to warmer weather and getting the grill out this spring! Thanks, Katie! I totally agree…I am seriously in need of some warmer weather right now. Thanks for stopping by! Fantastic use of the coconutty coffee! Your eclairs are responsible for the drool puddle all over my keyboard! So, can I say 10 eclairs are 1 serving?! You totally knocked it out of the park! Those are awesome!!! Eclairs are one thing that I have never attempted, but you make it sound so easy. And coffee cream inside is just perfect!!! Thank you so much, Jocelyn! Eclairs are totally not as hard as they seem…I was amazed. They involve several steps (shells, filling, and chocolate), but overall not that bad at all! I love eclairs. 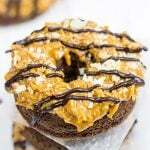 David you have me literally drooling at your pictures.Love the easy to follow recipe as well. Haha…thank you, Chichi! I take no responsibility for the drool on your keyboard. I really appreciate you stopping by! You and me both. I love ordering eclairs at bakeries but have always thought they are so hard to make. Thanks for bursting that right out!! 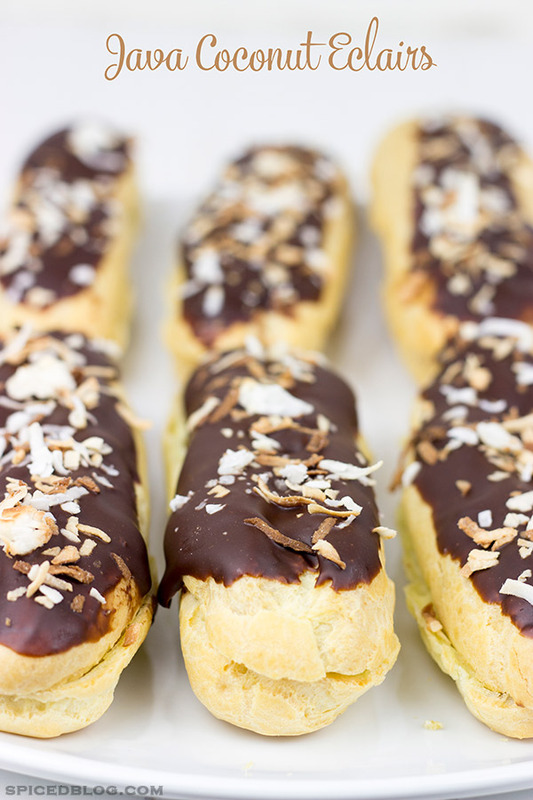 Love love these java coconut eclairs. They should be my best friends and just be my neighbor right away and I guess you can come too!! No way, Zainab! So much easier than you might think…especially for a skilled baker like you! And yes, I could’ve used you as a neighbor when I made these. Eclairs don’t last that long once filled…and I had 10 of them sitting there looking at me! The favorite thing about spring is seeing the bright yellow of the forsythia bushes. It’s usually the first bright thing to bring us out of winter. Happy Spring! Thanks for a great recipe – I will be making these for my company this weekend. Awesome! Thank you so much for commenting, Judy. I really hope you enjoy the eclairs…they are so much fun to make…and really impressive to serve! You know how you keep dropping hints about my wife and I moving upstate? I never really took it seriously, but now that I know you make homemade eclairs…. well let’s just say it’s a serious consideration now, haha. These look great man! Thanks, Chris! I seriously need a foodie neighbor to help me eat all of this! If you and Asheley move upstate, I’ll make you your very own batch of these eclairs. And a pot of soup. And ice cream. Need I continue? Haha!! I love to see the grass green up and the buds on the trees! Thanks for the awesome giveaway! Same here, Amy!! Hopefully we’ll start to see more green soon. Thank you so much for commenting! I don’t even know what to say about these eclairs! I would just eat the cream with a spoon! My favorite thing about spring is definitely the warmer weather! I also love that everything is coming alive and all the pretty sights and smells! Best season of all. Thank you so much, Jenn! I’m pretty sure I did eat the leftover cream with a spoon. Don’t judge! And yes, I’m totally ready for the warmer weather…all of the green grass and flowers really are a nice change from the winter. YESSSSSSSS! More dessert for me!! Nice work on this one, David. Ooooooooh! What a brilliant spin on a classic! Love love love! Thank you so much, Tina!! I’d save you for you…but I ate them all. Oops. I’m definitely excited about the Spring flowers! The flowers are one of my favorite parts, too, Lily…so nice to see some color finally! Thanks for commenting! I just found your Blog while surfing the Net for great recipes 🙂 My favorite part of Spring …. no more snow 🙂 !! lol , warmer weather,Flowers, leaves on the trees and Fresh fruit seasons starts ! Coffee and coconut, two of my favorite flavors. 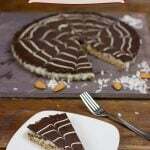 Got to try this recipe! Thanks, Chris! This is a really fun (and delicious) dessert…I hope you enjoy it. Thanks for commenting! Same here, Georgie! Thanks for commenting…Happy Spring! I second those favorite things, Bianca! The warm weather can’t get here fast enough this year. Thanks for commenting!